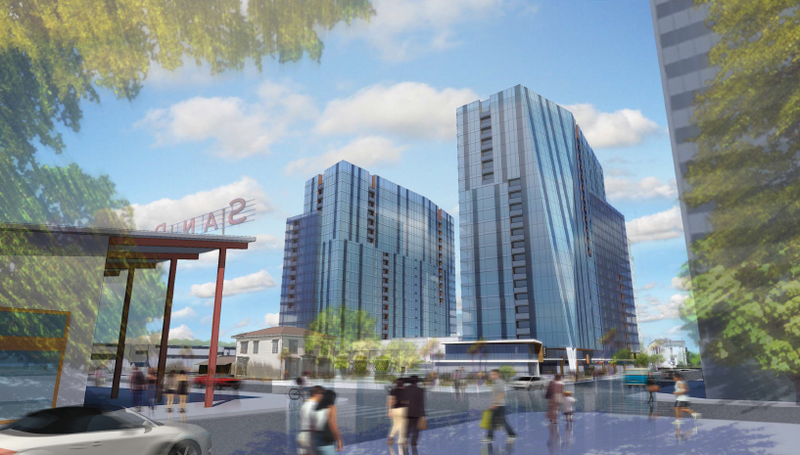 The San Jose Blog: Silvery Towers Approved by City, May Break Ground in 2014!!! 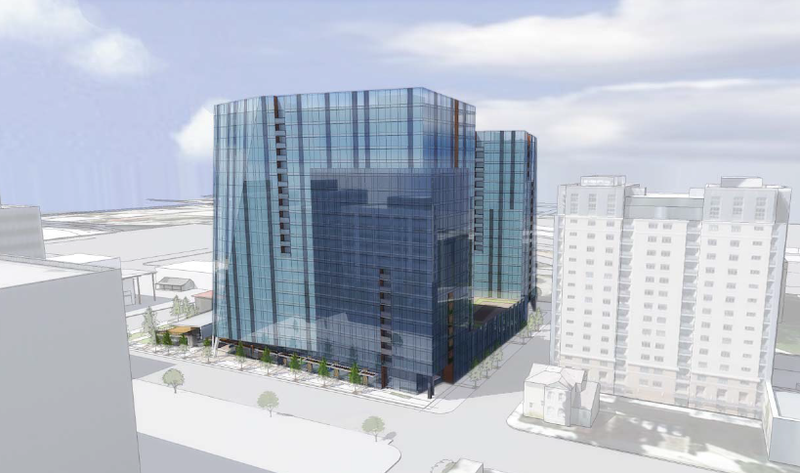 Silvery Towers Approved by City, May Break Ground in 2014!!! My favorite news always seems to come from Nathan Donato-Weinstein from the Silicon Valley Business Journal. Once in a while something comes along that really makes my day, and this would qualify. 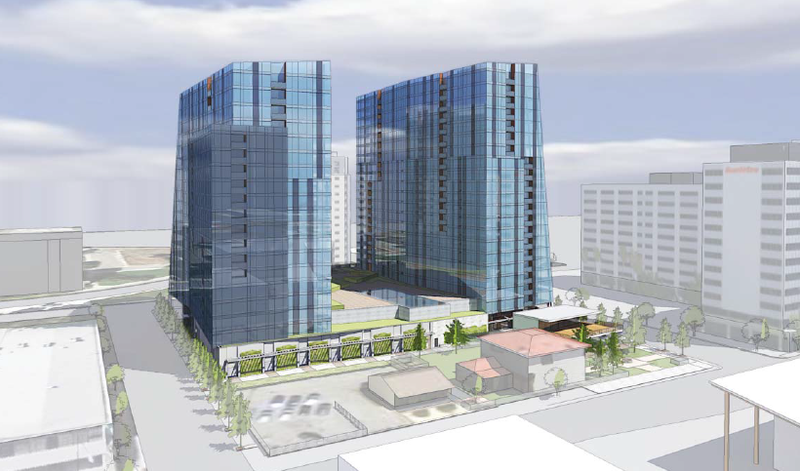 The city council approved Silvery Towers today, a dual tower 643-unit rental project with a whopping 20,000 SQFT of retail on the ground floor to compliment the neighboring San Pedro Square Market. The towers will be 228 feet tall and look phenomenal. 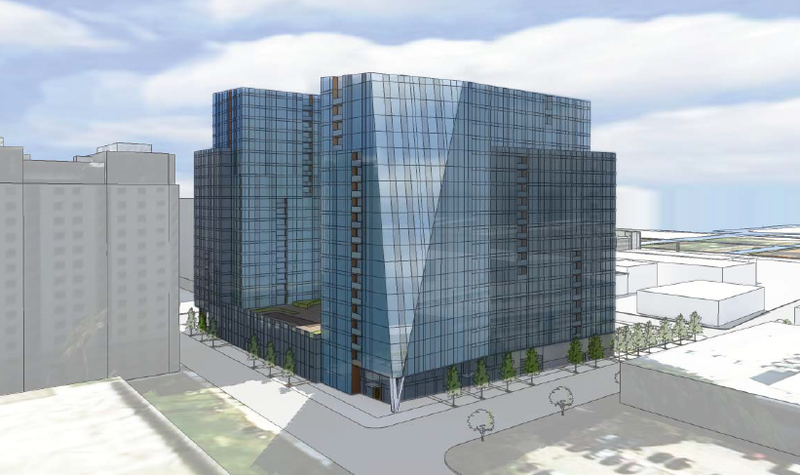 This would be one of the most modern, Silicon Valleyish designs of any high-rises Downtown. I especially like the LED lighting on the 3rd to last render below. 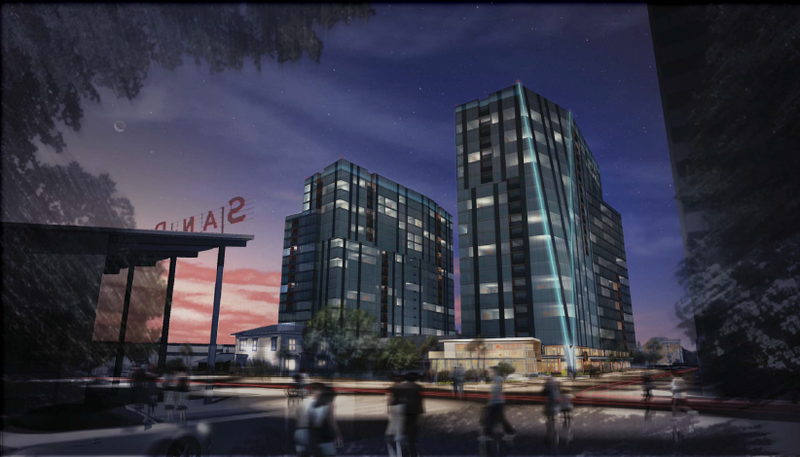 This would also be the largest residential project ever built in Downtown San Jose. It gets better... the developer (KT Properties) is already meeting with potential partners to get the $250 million to fund the project and is planning to break ground in 2014 with the first units ready to lease in 2016. Ideally both towers would be built simultaneously, although one would start six months before the second. The SVBJ article dropped a few other interesting nuggets of information. The retail pavilion in front of the towers will have a rooftop terrace and a basement bar (Singlebarrel 2 anyone?). They also might be doing a rooftop cafe (!) on one or both of the towers. Good day indeed. Like there was any chance city council wouldn't vote to approve this? I'm not super fond of all-glass modern skyscrapers. Looks like a boring office building to me. Especially towering over a historic district, it would have been nice to see a tall building with more of a 1900's feel, intricate architectural detailing, with lots of materials, stone/concrete/wrought iron instead of walls of bland glass. Something that would harmonize with our older towers, rather than clash. It all looks so already dated to me. Very 90s. A little more stepping up rather than that big wall would have been nice too, poor Fallon House is just swamped. I guess the site didn't have room for it though. At least there's retail on the ground floor. No street activation at all on the side and back though-- that looks like a scary featureless canyon from the drawings. So deep in downtown, all the ground floor areas should be retail and services. Could be worse, but I'm not celebrating. We'll celebrate for you then. Gosh, it's hard enough to get one of these things going due to the flight height constraint. And that the towers actually look this good is something we all should be happy with. Can't see how someone is NOT happy with this. Faceted corner cut lends it a diamond-cut look, with LED lighting the entire height of the towers. What's not to like? You want the older style tower? Centerra next door will be that. What's not to like? Well glass skyscrapers, with or without cut corners, look like glass skyscrapers. Modern architecture is wretchedly boring. I see a big but boring structure with minimal street activation that ensures that the areas around it won't be able to be easily turned into walkable, vibrant downtown areas. It doesn't look or feel like a good neighbor, like a building I would want to live near or walk around the back of, though I guess the LED lighting would make it easy to use to navigate at night. Architecturally, it's bland and just more of the same glass and steel that seems to be all that builders know how to work with. I'm all for dense urban living, but I don't think it is overly pessimistic to see this as an underwhelming design that sacrifices the streets around it. Yay for mediocrity? I'll have to go find the Centerra design, and see if it looks any more attractive.... Well, at least it's not glass and steel. But another very mediocre look. Can't find anything that shows whether it will have better street activation on the sides and back either. Maybe it's recently having been to Manhattan, but it is possible to make big tall buildings that are actually beautiful. Intricate and detailed and a pleasure to look at, not just big color blocks, angles, glass, and concrete. People did it all the time a hundred years ago. It's a crime that in this day and age, when there are all these exciting new technologies, our buildings have to be so ugly and bland. You might be an edge case here, I love the design and think it is a huge step up from just about any high rise in Downtown today... but I lean more towards modern/contemporary architecture. As for street activation, it has 20,000 SQFT of retail! 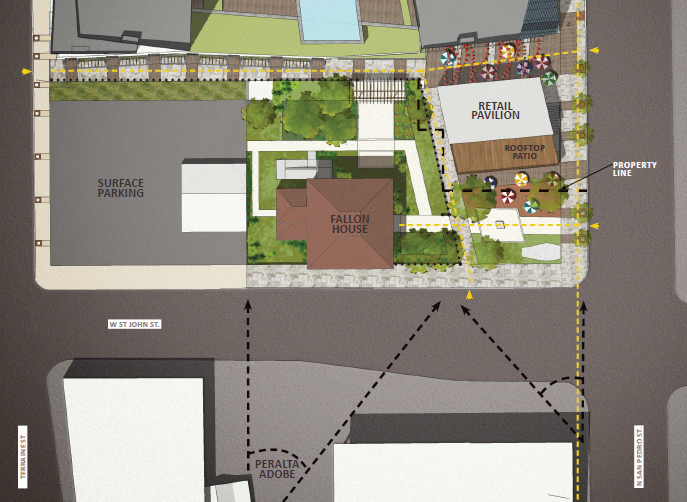 There is even a 3 story retail pavilion next to the San Pedro Square Market and the Fallon House. The backside of the buildings might not have much retail, but the front will synergize nicely with the market (as will Centerra which also has retail). I'm intrigued by the reference to a possible rooftop cafe. I've always thought that one thing missing from downtown SJ is a rooftop restaurant or observation area on a high-rise, open to the public. I know our high-rises aren't as tall as some other cities' because of the airport height restrictions, but the view from 22-23 stories up is still really cool, especially if it's a 360-degree view. 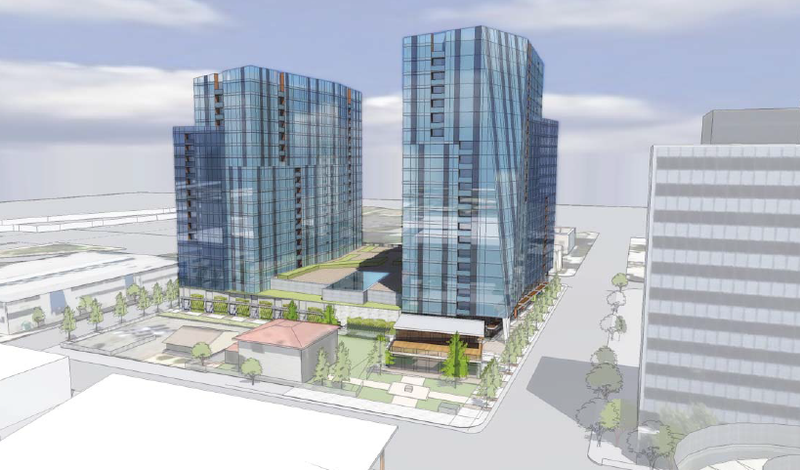 If a rooftop cafe happens on one of these towers, I hope they include both indoor and outdoor areas, because the outdoor will be pretty noisy due to the nearby flight path... would be good to give people both options. That's a great idea. Some of the cooler places I can think of off the top of my head are the miX Lounge and the Mandarin Bar in Las Vegas or the Signature Lounge in Chicago. ...and I imagine you'd have awesome views of the bellies of planes as they fly right at you or land in front you. Sure, why not. The up-close view of the planes would be a pretty unique thing, in my opinion. 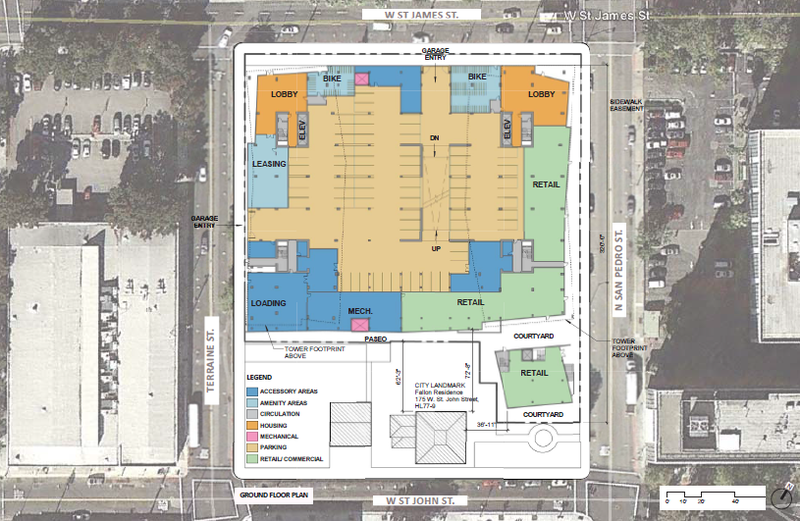 Most likely the cafe's outdoor section will face San Pedro Square and San Pedro street. Otherwise the noise and dust from the planes could be a problem. Has anyone check out this new food cart in San Pedro Square: https://twitter.com/StickersSJ ? I walked by it last weekend, caught me by surprise. It looked pretty good but I was too full to try anything. I like how it helps fill up the retail gap beside Peggy Sue's (giant parking lot). I get the significance of the name. Bad name. Very awkward. It is named after the founder of the company. Is that what you are referring to? No I dont think thats it. Nice to see more housing going into downtown. I really hope this will help push retail into downtown. Rooftop cafe/bar is so needed downtown. We have amazing weather almost year round, how do we not have a place to grab a drink on a rooftop?! Washington DC does this really well AND it snows there part of the year. Fingers crossed this actually happens. Well there is the Capital Club which has two awesome balconies 200 feet up. Scott's seafood is about 6 stories up. A public cafe on the 21st floor of a building would be amazing... really hope this comes true!